What is in the Patrick-Murray Administration’s Economic Development Policy? Analysis of "Choosing to compete in the 21st century". The overall analysis of “Choosing to compete in the 21st century” places job “creation” as the major economic development goal for the Patrick-Murray Administration. 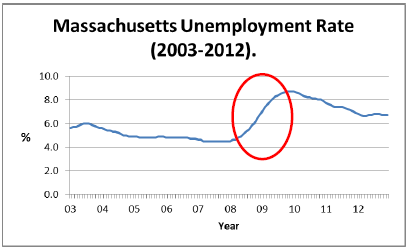 Massachusetts’ Government expects level of employments to be affected by their policies. Furthermore, Massachusetts’ administration expects to see inverse effects on the three subcategories of the labor market (Structural unemployment, cyclical unemployment, and frictional unemployment). The orientation of the policy seeks to ameliorate cyclical unemployment by substantially investing in infrastructure projects; it also seeks to reduce structural unemployment by educating the labor force in specific and demanded areas of knowledge; and finally, the policy aims at stimulating entrepreneurship so that frictional unemployment decreases. 8) Reduction of conspicuous consumption policy. Let’s start by reviewing the main policy objective: Job “Creation”. The current economic development policy in Massachusetts starts with a basic assumption: there is a “gap between demand and supply for middle-skill jobs in every region of the state” (Choosing to compete 2011, page 7). This assumption basically means that policy-makers in Massachusetts believe that part of the economic development challenges resides in curbing structural unemployment. Labor force has a fragment of unemployed people that do not have the skills required by job openings. Those skills are defined as “middle skills”. Structural unemployment shows up as an inverse function of training programs focused on “middle skills”, ABE/ESL (English as a Second Language) among others workforce development programs. “There remain, however, significant gaps between need and productivity in the area of middle-skill jobs (that is, jobs requiring more than a basic high school education, but not a bachelor’s degree). We focus, therefore, on this important area of need. Long-term success would substantially reduce or eliminate the gap between demand and supply for middle-skill jobs in every region of the state” (Choosing to compete 2011, page 7). Policy-makers in Massachusetts highly regard the statistics in table #1. Their analysis of economic development challenges focuses mainly on jobs and labor market figures throughout the state and throughout industries. Tables # 1 and # 2 may summarize the perspective public officials have on what they call the “gap”. The data public officials consider regularly comes from the Job Vacancy Survey, which is a semiannual survey developed by the Executive Office of Labor and Workforce Development. *Calculated by dividing the total number of job vacancies by the total number employed in the industry. Data Source: Job Vacancy Survey 2010, Executive Office of Labor and Workforce Development. Commonwealth of Massachusetts. * Job Vacancy Rate: Calculated by dividing the total number of job vacancies by the total number employed in the occupation. ** Hiring Demand Index: Calculated from job vacancy rates and US turnover rates obtained from the Current Population Survey. Calculated as follows: (Job Vacancy Rate/Turnover Rate)/(Total Job Vacancy Rate/Total Turnover Rate). ^ Hiring Demand Descriptor: The index value for all jobs is 1.0. High = above 1.2. Average = between 0.8 and 1.2. Low = below 0.8. The current administration was inaugurated January 4th of 2007, the same year that the Business Cycle Dating Committee of the National Bureau of Economic Research (NBER) determined as the starting point of the Great Recession (NBER, 2010). 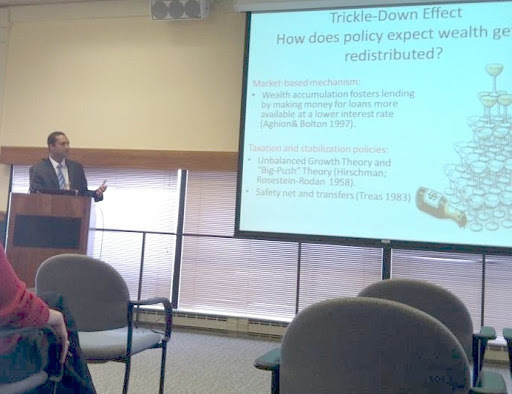 Some Government officials in Massachusetts believe that the economic contraction generated by the Great Recession must be addressed and ameliorated by public spending. Apparently, there is a consensus over the administration on having a counter-cyclical fiscal policy. Although infrastructure projects are presented as critical for improving competitive advantages, the numbers of jobs that are created by such projects are considered part of the stimulus plan to escape the Great Recession as shown in the Graph # 2. Cyclical unemployment becomes an inverse function of infrastructure projects, and also becomes the second concern for the Patrick-Murray Administration, targeting especially Gateway Cities. Data Source: Bureau of Labor Statistics. “Plan ahead for growth by identifying priority development areas for job and housing growth through regional planning efforts that include public and private participation, building on the example of the recently completed South Coast regional plan and the currently on-going 495/MetroWest regional plan”. Given the nature of Massachusetts’ economy and its academic cluster, economic “development” policy aims at keeping recent graduates working within the state. The purpose is twofold. First, the economy should create jobs for recent graduates, and at the same time, recent graduates represent an opportunity to retain a high skilled labor force for economic growth. The economic “development” policy intends to support startups businesses as well as promote internships. Therefore, frictional unemployment becomes an inverse function of innovation programs and strategies which focus on strengthening STEM (Science, Technology, Engineering, and Mathematics) areas of knowledge. “Increase by 20% annually over the next five years state funding of capital, mentoring and advice, including incubator and/or accelerator programs, for early stage entrepreneurs and small businesses, building on the example of Mass Challenge” (Choosing to Compete, 2011). “Under the leadership of the Massachusetts Technology Collaborative, identify three to five emerging areas of global innovation excellence in the Commonwealth and support public-private collaborations to accelerate the growth of such areas, building on the example of Mass Insight’s Advanced Cyber Security Center initiative” (Choosing to Compete, 2011). “Increase the production of rental apartment housing available in communities and regions of high market demand over the next five years, especially in or near locations with high levels of innovation and entrepreneurial activity, with the goal of significantly reducing the premium in rents between Massachusetts and the states with which we compete most directly for talent in our key industry clusters” (Choosing to Compete, 2011). “Increase by 20% annually over the next five years the number of internship placements made by multi-school, multi-employer internship programs, building on the examples of programs currently run by the Greater Boston Chamber of Commerce, the Federal Reserve Bank of Boston, Mass Technology Leadership Council, the Massachusetts Marketing Partnership, the Massachusetts Clean Energy Center and the Massachusetts Life Sciences Center, as well as newly proposed programs such as the Massachusetts Startup Fellows Program. The internship programs should, in particular, focus on facilitating the flow of young students into young companies to help them integrate into the local innovation economy” (Choosing to Compete, 2011). The first five policies may be associated with an intention to stimulate the supply side of the economy. All five policies -as factors- aim at Businesses primarily. The other three policies are certainly residual of the first six and are barely aimed at the Household sector of the economy. Job “creation” and/or level of employment becomes a function of innovating, funding start-ups, improving infrastructure, reducing transaction costs, and reducing costs of production(energy). The first and the foremost policy is innovation. Proudly, government officials claim Massachusetts has its major competitive advantage on the chance of educating college students from across US and the world. Choosing to compete in the 21st century, as Economic Development policy, considers that “innovation” is part of its culture. The policy aims at increasing such culture of innovation by aligning not only tax incentives, but also government assistance for businesses that grow through innovation and advanced manufacturing in Gateway cities. Innovation is understood by the economic development policy as a direct and positive factor of level of employment and therefore economic development. Choosing to compete in the 21st century explicitly proposes to “Establish a consistent pattern of state support for collaborative research and development among universities and businesses, building on the examples of the Holyoke Green High Performance Computing Center and the Massachusetts Life Sciences Center’s cooperative research matching grant program” (Choosing to Compete, 2011 Page 14). The Executive Director of the Massachusetts Office of Business Development, reported early in 2013 that “Manufacturing, Life Sciences and Information Technology were the top industries served – 146 manufacturing companies received some level of assistance from state agencies. This resulted in 2,313 new manufacturing jobs and 11,157 retained jobs Gateway cities were well represented this year with 78 businesses served, 36 of which are manufacturers” (Massachusetts Office of Business Development Report, 2012). Associated with innovation, entrepreneurship “action steps” are intended to support starting companies in Massachusetts. The intention is to provide start-ups businesses with access to capital, and articulation with the existing chain of supply of major corporations. Supporting start-ups with access to capital and assistance plays a factor role in the policy, given that government officials expect a fair return of economic development gains in terms of new jobs created within Massachusetts. The policy bolsters its proposal on the following assumption: “Massachusetts is extraordinarily fortunate to have entrepreneurs and innovators in every corner of the state. However, the Commonwealth can do much more to encourage, seed and catalyze innovation and entrepreneurship, particularly in communities and regions that are detached from the main engines of the state’s innovation-based economic growth. Government and the state’s leading civic organizations can themselves be catalysts for innovation by initiating a call for citizens and entrepreneurs to re-think solutions to civic and public challenges” (Choosing to Compete, 2011 Page 15). The government’s commitment on fostering startups businesses goes toward funding them: “Increase by 20% annually over the next five years state funding of capital, mentoring and advice, including incubators and/or accelerators programs, for early stage entrepreneurs and small businesses, building on the example of MassChallenge” (Choosing to compete, 2011 Page 14). Infrastructure investments are sold by government officials as improvements of competitiveness. Infrastructure certainly has contributed to the integration of markets and the creation of scale economies in the past for New England companies; however, infrastructure projects play an additional role while in economic recession periods. Given the period on what the Patrick Administration came to office (The Great Recession), statewide infrastructure plans have been associated with federal policy for economic recovery. The American Recovery and Reinvestment Act of 2009 (ARRA) has jointly funded projects in local areas such as the Hamilton Canal in Lowell. Therefore, Infrastructure projects are meant not only to improve competitiveness, but also to cope with economic recession. In this policy, infrastructure is understood within the realm of fiscal policy and/or government spending. Thus, infrastructure becomes a factor of economic recovery by reducing unemployment rate temporarily. Choosing to compete pushes for a “… growth by identifying priority development areas for job and housing growth through regional planning efforts that include public and private participation, building on the example of the recently completed South Coast regional plan and the currently on-going 495/MetroWest regional plan” (Choosing to Compete, 2011Page 18). One of the recent accomplishments the Administration claims is “Creation of the nationally recognized $3 billion Accelerated Bridge Program, to greatly reduce the number of structurally deficient bridges in the state” (Choosing to Compete, 2011Page 17). Transaction costs constitute the fourth major strategy of the Plan. The policy and government officials take a narrow and limited perspective of such costs; however, they still show certain level of awareness. The policy seeks a reduction on the burden that the public sector places on small businesses via regulation and taxation. Transaction costs may appear before exchange, at point of exchange and after exchange (North and Wallis, 1986); nonetheless, the economic development policy in Massachusetts focuses mostly on the burden that is created by the Commonwealth before the exchange. That basically means a commitment to reduce initial licensing, taxes, and an effort to curb costumer’s information asymmetry. Although limited, the approach that the administration has on transaction costs may be considered as a major strategy given that, supposedly, a reduction of them will increase the level of employment within the state. It appears to be an inverse correlation between transaction costs and job creation. Choosing to compete in the 21st century intends to reduce the burden created by old and new regulation on businesses. Explicitly, the policy proposes: “Building on recent legislative reforms, identify (with public and business participation) existing regulations within all Commonwealth regulatory agencies whose small business impacts could be reduced by limiting or eliminating the regulations, or by replacing them with model regulations widely accepted in other jurisdictions” (Choosing to Compete, 2011 Page 22). Choosing to compete in the 21st century also proposes a “Reform of EDIP investment tax credit program to more closely link awards with job creation” (Choosing to compete, 2011 Page 22). The last identifiable strategy is a systematic effort to reduce costs of health care and costs of energy for businesses. Choosing to compete in the 21st century considers such costs as critical areas that adversely affect job creation in Massachusetts. Regarding energy costs, the policy proposes a gradual transition to renewable sources. Therefore, these specified costs of production are identified as a factor for economic development and job creation. Apparently, the relationship is negative given that if such costs decrease, job creation will increase. Choosing to compete in the 21st century recognizes that “while containing the growth of energy costs is a paramount concern in the short-term, it is equally important to focus on longer-term, sustainable energy sources that will fuel our growing economy. The lack of significant indigenous energy supply in New England will require Massachusetts to examine carefully other choices, including non-traditional sources” (Choosing to Compete 2011, Page 26). The policy also seeks to “Accelerate the use of e-health technologies to support lower costs delivery of health care with equal or greater access and improved quality” (Choosing to Compete, 2011Page 26). *** Photo: taken from mass.gov. Contemporary economic development theories: "Development as Freedom" by Amartya Sen.
Brief history of Gateway Cities in Massachusetts: the long-run of current economic challenges.